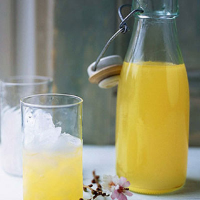 This simple home-made liqueur is sweet and tangy with a substantial alcoholic kick. It’s delicious drizzled over vanilla ice cream or served in small glasses, on the rocks. Grate the zest from the lemons and squeeze the juice. Put in a bowl with the sugar and stir lightly. Cover with clingfilm and leave to stand for several hours or overnight, stirring occasionally until the sugar has dissolved. Strain the lemon syrup through a fine sieve, or a sieve lined with kitchen paper, into a jug. Stir in the vodka. Pour the liqueur into a thoroughly clean bottle (one with a cork or clip top is ideal). Finish with ribbon and a decorative label. This can be made with limes, if you prefer – simply use eight limes in place of the six lemons, and follow the method as above – and it’s good made with oranges too. You could serve it as a long drink diluted with sparkling water or soda water.